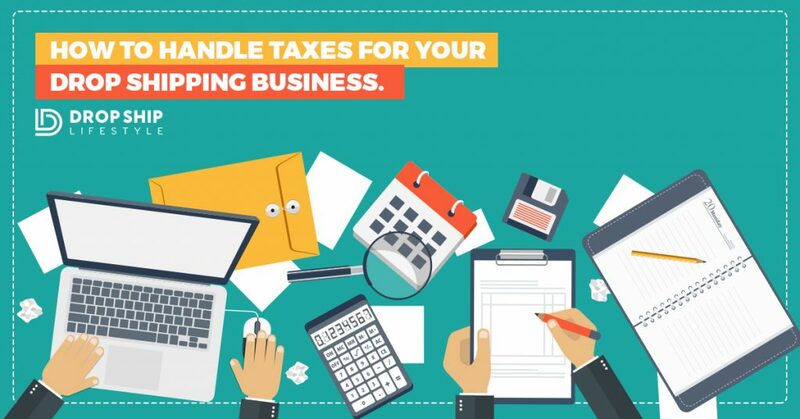 With April 17th (aka Tax Day) rapidly approaching for all of my friends in the states, I decided to create this guide to help you with Shopify taxes and hopefully save you some money before next tax season rolls around! This guide was created for people with U.S. based businesses. We have never operated businesses based outside of the U.S. and don't have any guides on taxes for non-US based businesses, but we do have this guide on drop shipping from outside the U.S. This post is not meant to be legal advice. The information presented here is solely for general information and is not to be relied upon as counsel or legal advice. When making any important business decision including setting up business entities, taxes, and intellectual property, always consult with an attorney. Drop Ship Lifestyle and the authors of this content expressly disavows any liability for this content. You are responsible for making your own legal decisions and should contact an accountant to advise on your unique situation. Taxes are something that no one wants to think about, but that everyone has to deal with, and I’m hoping this guide can give you some insight as to what to consider when running an eCommerce business. The first thing you should consider when running your store is whether or not you have to collect and pay sales tax. The second thing you should consider is in which states are you required to pay sales tax. Sales tax is a pass-through tax. This means, if required, you will collect sales tax directly from your customers before paying it directly to the state. Sales tax is handled at the state level so every state has different tax rules and laws. To determine which states you're required to pay sales tax in, you must first determine if you have a sales tax nexus. All states define this term differently, but the general definition of a sales tax nexus means having a presence in multiple states. A presence could be an office, a warehouse, employees, or even affiliates. If you determine you have a nexus in multiple states, you will need to obtain a sales tax permit (aka sales tax license) in each of the states for which you have a nexus. You'll also need to begin collecting sales tax in that state. If you determine you have no nexus in states besides your home state (where your business is registered), then you are only required to collect and pay taxes in your home state. In the example above, the amount of sales tax that you're required to pay depends on where in New York you ship your product to. For example, an order that ships to zip code 10010 would have a different tax rate than an order that ships to 11561. Every state has tools online that you can use to look up sales tax rates by address, but if you want to save yourself a lot of time you can look into a tool like TaxJar which will automatically add sales tax to your customer's orders based on their address. Every state has their own rules and laws for when sales tax payment should be submitted, but it’s typically either monthly, quarterly, or yearly based on your sales volume. Please note there are many benefits to creating a business entity, but for the purpose of this post, we will just refer to the tax benefits. Doing business as a sole proprietor simply means doing business as yourself. There are no tax benefits to doing business as sole-proprietor, although you will have the ability to write off all of your normal business expenses. Forming a single member Limited Liability Company (LLC) provides the benefit of personal asset protection from your business, but nothing for taxes. An LLC is a pass-through entity, meaning the business profits go straight to your personal taxes. Just like being a sole-proprietor, you can have the ability to write off all of your normal business expenses, but the income still goes on your personal tax return. If you file an “S-Corp” election (Form 2553) your corporation provides the benefit of limited personal liability, and can also provide some tax benefits. This is because you, as the business owner, can be treated as an employee of your S-Corp.
As an employee, you can pay yourself a fair market salary from the S-Corp. When you file your personal taxes, you will have to payroll taxes on your salary. The rest of the businesses profit (or loss) will then pass-through to your personal taxes as a distribution. While you’ll still pay taxes on the distribution, you will save the 15.3% in payroll tax on the distributed part of your income. If you’re doing business as a sole-proprietor or single member LLC, you will pick up $300,000 on your personal tax return. You will be responsible for payroll tax (15.3%) on the full $300,000. With the help of an accountant, you should be able to capture most of the major deductions for your Shopify taxes. But just in case you decide to do your own taxes, I’d like to point some possible deductions for your eCommerce business. If you are operating your business from a home office then you have a few deductions that can be claimed on your Shopify taxes. There are two methods for calculating the total deduction, one uses $5 per square foot up to $300. Or you can use the regular method, based on a percentage of square footage used for your office, then take your total rent or mortgage and deduct that percent. So if you are using 15% of your living space as an office you can deduct 15% of your mortgage interests on your tax return. Using the same square foot percentage you can deduct utilities used (heat, water, and electricity) as well. I hope you found this guide helpful as a starting point for Shopify taxes! But please don’t forget there is no substitute for a great accountant and you can often consult with one for free if you’re considering becoming a client of theirs. Everyone's tax situation is different so my advice is: do your research, ask for referrals, and meet with an accountant. Then make a plan to collect (and keep!) as much money as possible in 2018. Is Dropshipping DEAD?! Will Dropshipping Survive Past 2019? Hello Anton…when I contact the suppliers for an online retailer account they will ask me if I pay taxes or if my store is registered in my state? The second question: DSMOZ offer me a lot of suppliers…may I work with the biggers one? I mean ,I saw a lot of big factories there (constructions,electric companies products etc.) with expensive products. Thank you! I’ve never had a supplier ask me if I pay taxes… however, they will want your business address (which is technically where your business is registered). I have just set up my Shopify dropship store which took me quite a long while to do because I do not have the technical skills one need to do these things. I had to get some help to assist me with that side of the setting up. Now that the shop is up and running and I have uploaded some products to my store I need to know how to market my products to get visitor and convert them into buyers. that is my big problem. where would I find information on marketing. Thank you. Do you offer any advice to Latin marketers? Yes, we do! Included in Drop Ship Lifestyle is our Doing Business Abroad course which will help you set up your business from anywhere in the world. Be sure to click here to check it out and send me your feedback ?